Proudly built in Barnoldswick, UK the Pro 4 continues Hope's tradition of reliability, serviceability and performance. With more axle options than ever before, find your fit with the Hope Pro 4. Equipped with stainless steel bearings. Taller Flanges than the Pro 2. Additional end caps sold separately. Convertible to 10mm Thru Bolt x 135mm, 12mm Thru Axle x 135mm, and 12mm Thru Axle x 142mm with end caps. 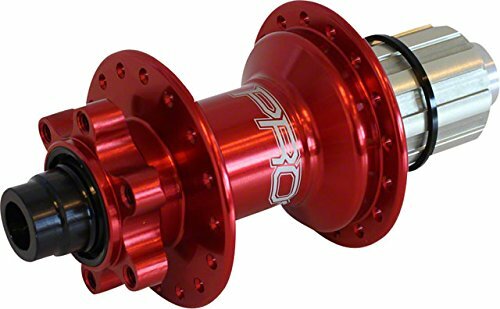 Features a 9-11 road and mountain compatible alloy Shimano Freehub, includes spacer for use with 10-speed road cassettes and 11-speed mountain cassettes. Upgraded 44T ratchet ring and 4-pawl drive system for quicker engagement. Color: Red. Hub Drilling: 32. Cassette Body Type: Shimano Dynasys 11 Speed Mountain. Cassette Body Type: Shimano/SRAM 11 Speed Road. Cassette Body Type: Shimano/SRAM 8, 9, 10 Speed. Bearing Type: Sealed Cartridge. Skewer Included: No. Defined Color: Red. Spoke Interface: J-Bend. Rear Axle: 12mm Thru x 142mm. Hub/Brake Compatibility: 6-Bolt Disc. Center to Flange, Left: 33. Center to Flange, Right: 19. Flange Diameter, Left: 57. Flange Diameter, Right: 57.